There seems to be a transformation happening in the AFP. I say this while fighting my own skepticism and as I determine to be volitionally hopeful. I have no filing system in my heart and mind about these two categories — “Human Rights” and “AFP”. My past experiences with them (many were traumatic) during the Martial Law Regime, when I was a student political activist, make me uncomfortable every time I am around military personnel, and especially when I visit the AFP General Headquarters. But my faith-conviction as a Christian peace and reconciliation missionary compels me to open my mind and my heart, beyond my psycho-social comfort zone. I guess this is a part of my psycho-social transformation. In the past two years a non-government organization called Alternative Law Groups facilitated Community-Based Dialogue Sessions on Human Rights with the Armed Forces of the Philippines (AFP) and the Philippine National Police (PNP). The goal of the two-year dialogue series thoughout the Philippines was “to contribute to the improvement of Human Rights situation in the Philippines primarily through the enhancement of the relationship between the AFP and the PNP, on one hand, and the local communities and civil society organizations, on the other hand, in the common effort to promote human rights.” The dialogue participants in each session included 10 representatives of the AFP, 10 representatives of the PNP, and 30 representatives from civil society organizations. The regional officers of the Commission on Human Rights attended the sessions and helped discuss the human rights situation in their respective regions. The issues raised were the ones we used to write on our placards as we shouted on the streets some 30+ years ago. Now, the same issues are being raised, paid for by the AFP, within the AFP General Headquarters. This is mind-boggling for a person who grew up in the 70s! :: Military Harassments — threat to organizing groups; name-tagging on non-government organization workers; harassments during rallies; harassments of support groups; harassments of fact-finding teams, harassments of Indigenous Peoples (IP) communities and Moro communities. 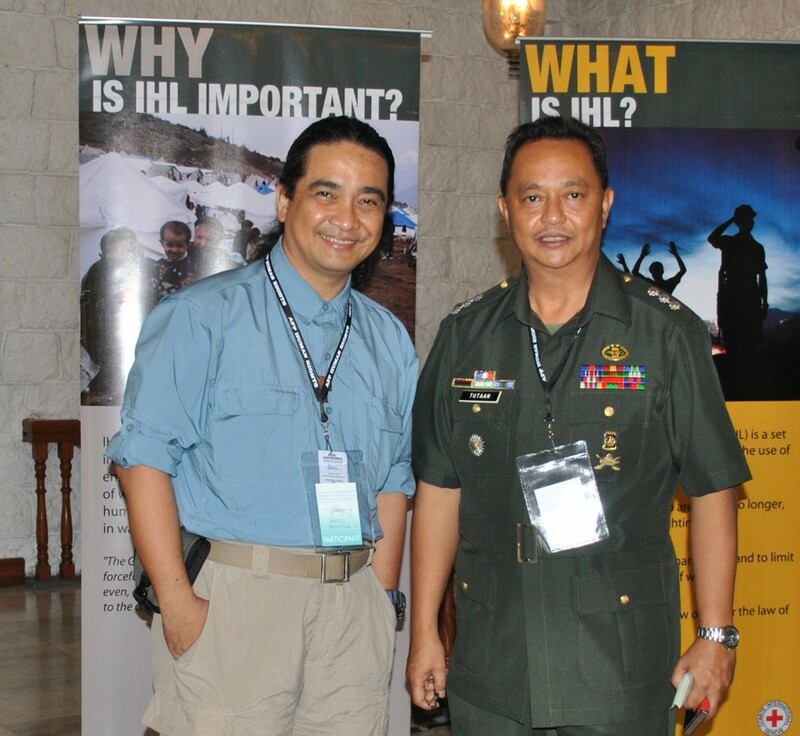 This First AFP Conference on HR and IHL is described by my friend, Col. Domingo J. Tutaan, Chief of the AFP Human Rights Office (AFP HRO), as a “paradigm shift on how AFP views its mandate of protecting the people and the state… a shift from predominantly militaristic solution to a people-centered security strategy.” Col. Tutaan and I met on the field — one of the insurgency hot spots in Mindanao — a few weeks ago. He loves to call the new “AFP Strategic Intent” as “WINNING THE PEACE” (that’s how he wrote it, in capital letters). :: working with the Commission on Human Rights (CHR), other human rights organizations, NGOs, civil society organizations, and public officials for the promotion and protection of HR and abidance to IHL. Well, I promised Col. Tutaan, in front of Bishop Tendero, National Director of the Philippine Council of Evangelical Churches (PCEC), that the PeaceBuilders Community, Inc. (PBCI) and the PCEC Peace and Reconciliation Commission (PARC) will actively watch the implementation of this new initiative of the AFP in institutionalizing Human Rights in its structures, culture, and value system. As a spiritual segment of Philippine society, the PCEC-PARC will watch and monitor AFP Human Rights dynamics among the top military leadership, while we at PBCI will help watch and monitor, along with other CSOs like Amnesty International, on the field. We are hopeful for this apparent initial implementation of a Security Sector Reform in our country sides. May God help our people and our land truly experience the genuine adherence and abidance of Human Rights, and genuine implementation of the International Humanitarian Law in this beautiful land. 17.DECEMBER.2010. Tejeros Hall, AFP Commisioned Officers Club House, AFP General Headquarters, Camp General Emilio Aguinaldo, Quezon City.